Archaeological discoveries in China rarely get noticed. Recently, though, mitochondrial DNA tests conducted on human remains from Xinjiang, China's westernmost province, got the attention of international media. The results suggested the presence of "Westerners" in China as early as the third century B.C., during the lifetime of Qin Shui Hang (259-210 B.C. ), the first emperor of China. It happened just as new and startling claims were being made about Emperor Qin's own tomb in Shaanxi Province – the tomb most famous for its buried ranks of some 8,000 life-size terracotta warrior sculptures. In a BBC article, archaeologist Li Xiuzhen said that the many sculptures found in and around the tomb – including the Terracotta Army, but also sculptures of musicians, dancers and acrobats – were "inspired by ancient Greek sculptures and art." The alleged "Greekness" of the Terracotta Army went viral, but archaeologists in China (and around the world) were skeptical and dismissive. Two weeks after the story broke, Zhang Weixing, head of the Emperor Qin Shi Huang's Mausoleum Site Museum, told the AFP that there is "no substantial evidence at all" for contact between ancient Greeks and those responsible for the Qin tombs. Li Xiuzhen even backtracked, protesting to Xinhua News Agency, China's largest official state press agency, that her words had been taken out of context. "The terracotta warriors," she clarified, "may be inspired by Western culture, but were uniquely made by the Chinese." She also told Xinhua that her ideas had been misrepresented after being placed alongside those of art historian Luckas Nickel, who had speculated that "a Greek sculptor may have been at the site to train the locals." Why were Xiuzhen's comments so controversial? For centuries, archaeologists and art historians have been eager to see the imprint of the Greeks in works of art and architecture throughout the world. But this view rests on a Eurocentric logic which has long assumed other civilizations were fundamentally incapable of creating highly technical, impressive and aesthetically pleasing works of art. The best and only way? Entasis actually appears in early architecture around the world. Even so, in the early 19th century, some Europeans took its presence in early Japanese temples Greco-Buddhist art" was invented to explain the pleasing proportions and elegant poses of sculptures from ancient Gandhara (in modern-day Pakistan). The only way to explain their sophistication, Europeans believed, was the influence of Alexander the Great and his retinue of talented Greek artisans who had traveled to Gandhara in the latter part of the fourth century B.C. 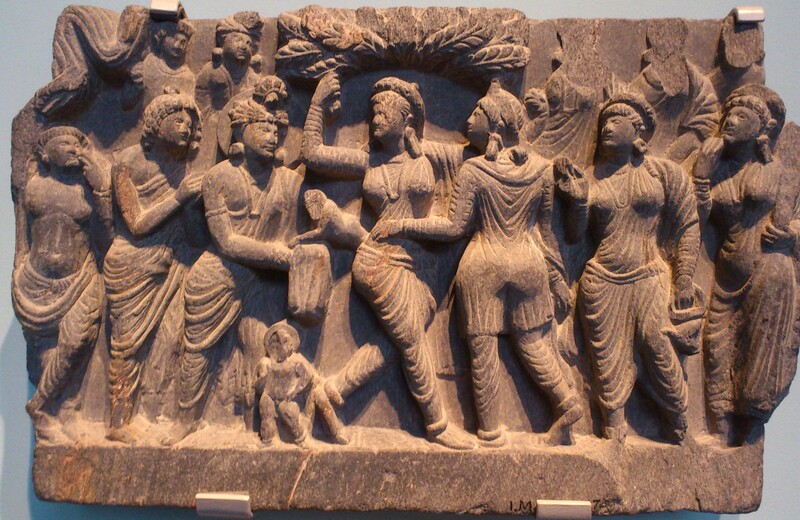 Art historian Michael Falser has recently shown how the concept of Greco-Buddhist art, or Buddhist art with a Greek "essence," is really a colonial notion that originated during British rule in India. In the West, examples of this art (represented largely by sculptures of Buddha), have since been largely interpreted as the result of Greek influence – and thus, implicitly, as an early example of successful European attempts to civilize the East. Throughout the 19th and 20th centuries, explorers and anthropologists also explained exotic foreign customs through a lens of Greek traditions. They attributed an old Chinese custom of burning offerings from friends on the funeral pyre of the deceased to the Greeks. Meanwhile, they claimed household organization among Circassians, an ethnic group on the northeast coast of the Black Sea, was inspired by the Greeks. Likewise, travelers and archaeologists often fell back on theories of direct outside influence. How else could they explain sophisticated artistic techniques and engineering genius among "primitive" societies? In 1871 the German explorer Karl Mauch, on a quest to find the biblical region of Ophir, came across the ruins of the capital of the Kingdom of Zimbabwe, which had flourished from roughly the 11th to 15th centuries. Certain that no African people could have ever constructed such marvelous structures, Mauch vigorously publicized Great Zimbabwe as a city built by the biblical Queen of Sheba. This, he pronounced, was her Ophir, the source of the gold she sent to King Solomon (the Bible's proverbial "gold of Ophir") to use in the first Temple in Jerusalem. A century later, certain scholars came to doubt that the Olmecs, whose civilization thrived in parts of Mexico and Central America 3,000 years ago, could have crafted monuments as spectacular as the colossal stone heads of central Mexico. In an ironic twist, those scholars sought to explain the sculptures by postulating pre-Columbian contact not with Greeks or biblical rulers but with Nubians and other African peoples. Whenever we say the cultural achievements of other societies are due to geographically remote – but familiar – genius and inspiration, there's a cost. In the cases of the Terracotta Army and Great Zimbabwe, European scholars have struggled to understand non-European architectural and artistic achievements without resorting to the explanation of ancient Greek or biblical civilizations. That kind of thinking also projected modern European tastes onto Chinese and African antiquities. Greek statues, so coveted by museums and collectors today, must also have been what the first emperor of China wanted for his own tomb (or so the thinking goes). This mirage of an ancient cultural global influence has an impact. It makes us forget the diversity of places that many look to for inspiration and validation. Erased are ideas of origins and narratives of belonging. Transcontinental traffic in the ancient world made it possible for Chinese silk to arrive in Roman Palmyra (in modern Syria). But would it make sense to explain this ancient capital as the product of ancient Chinese genius? As a thought experiment, it's worth considering one striking inversion of the familiar bias. In the summer of 1668, an Ottoman traveler from Istanbul named Evliya Çelebi arrived in Athens. Like Mauch in Zimbabwe, Çelebi was none too impressed with the contemporary, indigenous inhabitants that he encountered, infidels with "300 houses of idol-worship." Surely Greeks could not have built such a marvelous city, Çelebi said. In his "Book of Travels," Çelebi followed the precedent set by "all the Christian and Coptic chroniclers": he attributed the founding of Athens to the prophet Solomon and, like Mauch in Zimbabwe, to the Queen of Sheba.